Ambulatory-care sites offering an expanded array of services, such as the convenient-care centers operated by Memorial Hermann in Texas, are growing in popularity. The architects and construction companies who make their living designing and building healthcare facilities are bullish in their outlook on healthcare construction, despite the uncertainty surrounding healthcare policy in Washington, D.C. When asked to forecast their business prospects, half of these construction leaders predicted “slow but steady growth,” while another third foresaw a “strong” book of business ahead. “Demand for clinical care remains high,” said Stacy Rudd, healthcare market leader for Alberici/Flintco, a Tulsa, Okla., general contractor. Rudd hedged his robust assessment a bit in the survey by predicting slow but steady growth. His optimism was tempered somewhat by the uncertain political climate. “The new Trump administration has many healthcare leaders in a wait-and-see mode before they appropriate funds for new facilities,” Rudd said. “They've got a bill in front of Congress to repeal Obamacare, so healthcare leaders are worried and when they're worried they're going to pause and hold up on projects for a while. “If it shakes out by the end of the second quarter, the second half of the year is going to be strong,” Rudd said. Ankur Gupta, a lawyer who heads the real estate practice in the Chicago office of McDermott Will & Emery, said he “couldn't be more bullish on where the healthcare market is in the utilization of real estate.” Though his practice covers other industries, Gupta said he spends 90% of his time these days handling healthcare transactions. In addition to political instability, survey respondents also mentioned other possible drags on future healthcare construction spending: soaring healthcare costs, cost-shifting to patients in the form of higher deductibles and out-of-pocket costs, payment reform and the advent of consumer-facing mobile health technology. In the survey, only 1 in 8 (13%) respondents cited acute-care hospital construction as their biggest opportunity. But nearly 1 in 4 firms (24%) reported having an acute-care hospital renovation or expansion project on their books. In contrast, more than 83% of survey participants reported that their biggest business opportunities are in designing and building outpatient facilities. More than half (54%) mentioned construction projects in “ambulatory care” in general. Seventeen percent specifically mentioned medical office buildings, 7% cited stand-alone emergency departments and 6% cited urgent-care centers as key opportunities. Construction leaders continue to see their biggest opportunities in outpatient care, but providers still face challenges delivering levels of customer service that patients have come to expect. With an outpatient facility, in some cases, it's built to a lower-cost “business occupancy” level of building codes, design and construction, Quirk said. “If you built a typical hospital, it's built to an institutional occupancy” set of regulations. “Life-safety codes are higher and the costs typically go up with that, which is one of the reasons healthcare facilities are so expensive. “That does change construction,” Quirk said. “Instead of building typical hospitals, we're asked to look at different building types” with more modest construction costs. Behavioral health centers and an assortment of projects for seniors—ranging from senior housing and assisted-living to so-called “memory care” facilities for patients with Alzheimer's disease and other forms of dementia—rounded out the top six construction hot spots. Each received backing from about 15% of respondents. Jacobs is executive vice president of Caddis Partners, a Dallas real estate developer that built and owns the convenience center's structure. Caddis leases it long-term to Memorial Hermann, which staffs and operates the clinic housed there. The facility sits on 9.3 acres, with another 3 acres set aside for possible future expansion. It offers patients access to Memorial Hermann's primary-care physicians and specialists; a 24-hour emergency room; CT, X-ray and 3D mammography scans; a lab; and a sports medicine/rehabilitation center. From the healthcare system's perspective, “it started a couple of years ago when Memorial Hermann was looking at our growth strategy and how we could go into the markets that we felt had coverage gaps and were medically underserved,” explained Teal Holden, the system's vice president of operations for ambulatory services. 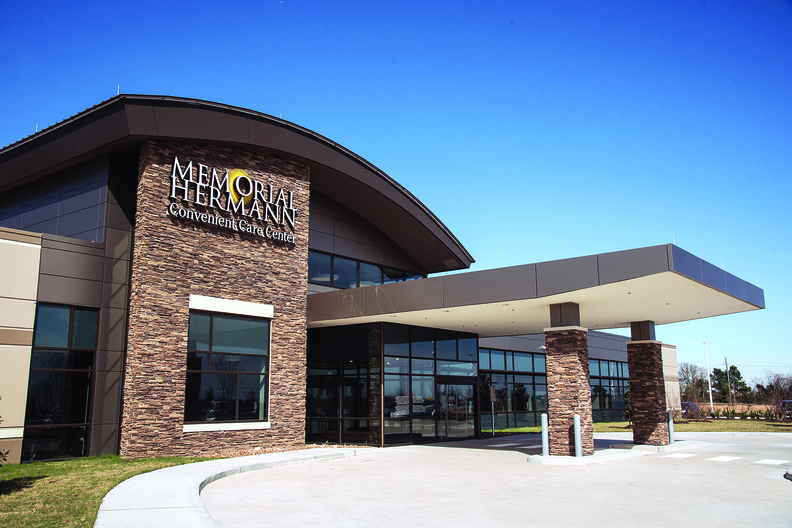 Memorial Hermann now has five convenience centers, with three more under construction. Typically, the convenience centers are within a 10-mile radius of an existing Memorial Hermann hospital. A small number (7%) of healthcare architects and designers saw promising opportunities in “micro-hospitals,” a step up from the convenience center. A micro-hospital typically includes eight to 12 inpatient beds to go along with the ER, radiology labs and rehab facilities. Emerus Holdings is a pioneer of the micro-hospital concept, opening its first in 2007 in Sugar Land, Texas. The privately held company, based in the Woodlands, Texas, has 21 micro-hospitals and another seven to open by year-end, giving it locations in Colorado, Idaho, Nevada and Texas. All but two of them operate under joint venture agreements with major healthcare providers, including Baylor Health Care System in Dallas, Baptist Health System, San Antonio, and others. Under the joint venture model, Emerus is responsible for site selection, design and other management responsibilities, said Jason Lisovicz, the company's senior vice president of marketing. Emerus' micro-hospitals range from 15,000 to 50,000 square feet. They cost $7 million to $35 million to build and are staffed with 50 to 100 people. A typical facility opening today will have eight ER bays and eight inpatient beds. While construction spending is trending toward outpatient care, many of the larger systems building them are at sea when it comes to turning them into cost-competitive centers from a consumer perspective, which is increasingly important in an environment where people find themselves in high-deductible health plans and are responsible for the first $1,000 or more of hospital expenses. “Health systems have never run the outpatient side of the business like a business, even though it accounts for half the revenue,” said Zachary Hafner, a Chicago-based national partner in the strategy consulting practice at the Advisory Board Co.
“They're making the investments to create the access points, to create what consumers are interested in and being relevant in the market where consumers are going to be spending their money.” But these health systems still need to improve on customer orientation and service, he said. “Until the industry learns to run that part of the business and creates a value proposition, there's going to be a race to the bottom competing,” Hafner said.